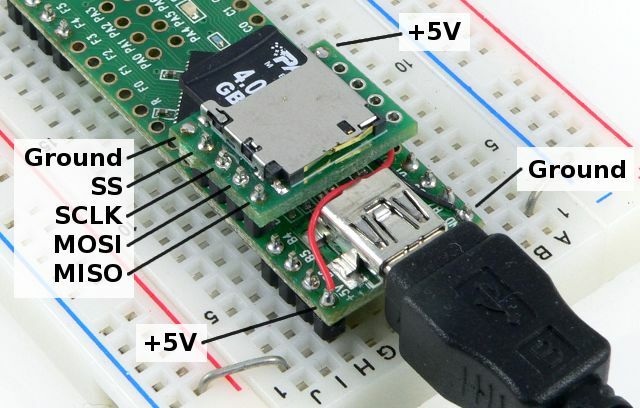 This SD Adaptor board allows a Micro SD card to be used with Teensy, or almost any microcontroller with a SPI port. Only 4 SPI signals, plus power and ground are required. A 3.3 volt regulator and buffer chip allows using Micro SD cards with 5 volt systems. The board size is 0.7 by 0.52 inch. The pins are 0.1 (2.54 mm) spacing, compatible the solderless breadboard and most electronic prototyping materials. The two 5-pin rows are 0.6 inch apart. Teensyduino 0.9 (currently in experimental alpha release) supports SD cards for USB communicatoin. Select it from the Tools->USB Type menu after installing version 0.9.